For those of you that are big clean freaks, you might not entirely like this concept. I’m not even obsessive about germs and dirt, but this still doesn’t entirely sit well with me. Most washing machines wash your clothing and then send the dirty water down the drain. As far as the green aspect goes, that’s a huge waste of water and therefore a bit of a bad thing. 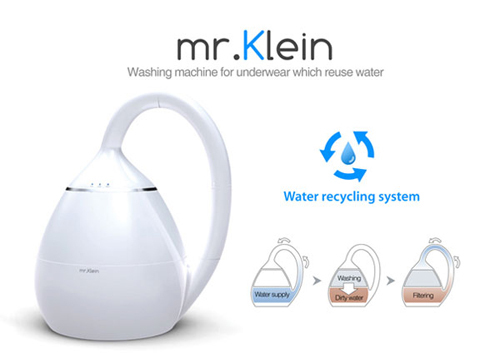 This Mr. Klein concept does something a little different with that water. After it cleans up your dirty underwear, it will save the water to be used again for another load. I know I should be excited about a concept that reduces my water usage, but I’m just not. It of course uses a filtration system that will take all of the contaminants out of the water before it uses it again. Which means it’s perfectly safe. I think I could handle it if I could just somehow manage not to think about it. If only there was an off switch for your head. Right now this is still a concept though, so you don’t have to feel guilty just yet for not rushing out and getting one. We’ll just have to keep sending our dirty water down the drain, even if it is a bit shameful.